Mayor de Blasio has instructed NYC DOT to move forward with the redesign of Queens Boulevard in Elmhurst following a contentious meeting of Queens Community Board 4 last night, in which the chairman hastily pushed through a vote against the bike lane portion of the project. The CB 4 meeting last night was a travesty of public process even by the standards of New York City community boards. Immediately after arguing that Queens Boulevard “is not a park, it is a very heavily traveled vehicular roadway,” CB 4 Chair Lou Walker moved to “accept the safety plan for Queens Boulevard except the bike lane.” The resolution passed in a quick show of hands, with one member opposed and one abstention, but multiple board members appeared to be confused by Walker’s phrasing and the rush to vote. Some board members walked out in dismay right after the vote, and dozens of people in the audience who supported the bike lane turned their backs to the board and then left the room. The median bikeway is a centerpiece of the Queens Boulevard redesign and the project would make no sense without it. DOT implemented the same basic template — claiming space on service roads to create continuous paths for walking and biking on the medians — on 1.3 miles of Queens Boulevard in Woodside last year. The proposal on the table at CB 4 last night would extend that design another 1.2 miles from 74th Street to Eliot Avenue. A third phase through Rego Park and Forest Hills is scheduled for 2017. Queens Boulevard is one of the only direct east-west routes across the borough, and many people already brave its chaotic traffic on bikes. The portion of the street covered by this phase of the redesign includes the block between 55th Road and 55th Avenue where a truck driver struck and killed Asif Rahman in 2008. The phasing of the project has been public since early 2015. DOT started laying the groundwork for this portion in October, notifying CB 4 about its plans. At a DOT public workshop in November, many attendees said this 1.2-mile stretch of Queens Boulevard needs a protected bike lane. The DOT plan would make the service roads on Queens Boulevard function more like local streets and less like highways, while adding a median bikeway and pedestrian space. DOT also worked with businesses along the corridor — including Queens Center Mall — as it developed a plan that it presented in March to the CB 4 transportation committee, where Walker was also present. The plan has been available on the DOT website since then. Nevertheless, last night Walker and other members of the board’s leadership insisted throughout the meeting that the plan had somehow been sprung on the board all of a sudden. “This is the first time the board saw this, and I don’t think we can digest it as quickly as you’d like us to,” said transportation committee member Jimmy Lisa, who was also at the March meeting where DOT presented the plan. It is typically a committee’s responsibility to convey the substance a plan to the rest of the community board. Last night was the first time the full board heard the presentation directly from DOT. 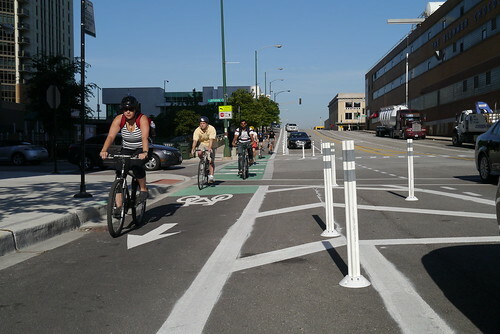 During the hour-long board discussion of the project, many members seemed open to the redesign and supportive of the bike lanes, with some more skeptical than others. Other board members expressed explicit support for the bike lane. 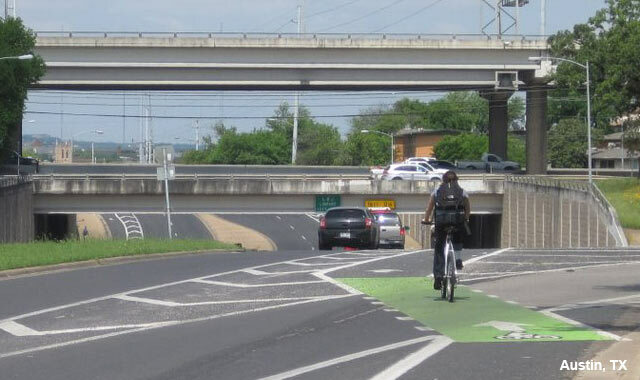 “It’s very important to me that there should be a bike lane because what I’m seeing as a driver — it’s dangerous if you don’t have a bike lane,” said board member Priscilla Carrow. Immediately after the meeting, DOT Deputy Commissioner Ryan Russo tried to process what had happened. “We have to take [the board’s resolution] back, we have to consider it,” he said. “But I think people don’t really want a shared lane or people sharing the traffic lanes with cyclists, so I’m really not sure what the board’s expectations are.” With de Blasio’s directive to proceed with the project, it’s clear that DOT will go ahead with the redesign as planned regardless of what the board’s expectations may be. Wow, good to know that the safety of some New Yorkers counts more than others. Absolutely the right decision by the Mayor, after an absolute travesty of a CB meeting. This will save lives. And huge thanks to Danny Dromm who has been a huge supporter of this and other safe streets projects in his district. this isn’t a game, it should not be subject to petty politics and personal pet peeves. People are dying on our streets despite our ability to redesign them to make them safer and make drivers go more slowly and be more aware. Please thank the mayor and be there to call out the inevitable detractors who will criticize him as “ignoring the will of the people.” In no way is what happened at last night’s meeting representative of the will of the people. It was a complete abrogation of it, and thankfully the Mayor has corrected that. I can’t help but feel like Community Board 4 invited its own rebuke by Mayor de Blasio when Chair Louis Walker subverted the public process by pulling one over on his own board members by proposing a motion, calling a vote, and then trying to move the meeting forward before other motions on the matter could be made. If so, then I thank the board leadership for bungling the issue, chastising those in the public and on the board who supported the project, and generally being hostile to the issue of safety. They all but invited the mayor to sidestep them as they sidestepped the community and the board, and that our mayor did. We can only hope future opposition is as nakedly opposed to full discussion of these proposals and pulls similar shenanigans. It was amazing how he repeatedly refused to allow other members to move for a vote on the project – despite at least one such motion receiving a second – until he was ready to launch his own motion. A complete abuse of power. Nonsense like this delays and prevents the city from having a comprehensive bicycle network. The way the proposed westbound bike lane switches to the opposite service road for 2 blocks at Woodhaven and the fact that the green paint doesn’t continue across the slip junctions pretty much gives away that cycling is an afterthought anyway. The scariest part is that a lot of people think that way. Well, this is encouraging. But this needs to become standard practice, not a one-off. There are plenty of other situations where CBs, including this one, are employing the same stalling tactics to thwart street safety measures and getting away with it. What will you do for the children crossing 111th Street, Mr. Mayor? Wow, De Blasio personally actually stuck his neck out for this. Good for him. This is the kind of support we need from the mayor to actually achieve Vision Zero. Also, it seems that the elected leadership is increasingly convinced that bike lanes and street safety have fairly widespread support. The problem seems to be that the unelected CB members are increasingly of touch with what the actual constituency wants. In a system with zero accountability for CB members, there is no end in sight to this type of self-serving behavior. The notion that there is a finite number of people who are “cyclists” on some kind of permanent basis is so commonly held that I think many people who are pro-cycling (or “pro-cyclist” as they call it) need to be dissuaded from it as well. It’s as if Christian Cassagnol doesn’t consider people who ride bikes to be full human beings. That is an incredibly dangerous line of thinking. My favorite (?) moment was New Life Fellowship Church’s social media person attempting to convince me that they favor parking spots over saving lives. If you look at his comments, he really doesn’t. I was in attendance at last night’s meeting, and I can say the democratic process was a mess. Three of the board members knew of the plan back in March and just reiterated the same complaints since then. It’s been 2 months, what happened? Board members were confused about how to vote for items on the floor, not once but twice (the other issue about a liquor license). Also with the applause, it appeared those in favor were chastised while those against able to applaud, including the chair, who also threatened to adjourn the meeting after the next spontaneous applause. So hypocrisy and political games were not in short supply. As well as misinformation…such as the bike lane causing congestion. That is immediately out because at it stands, the leftmost parking lane of the service road cannot be used for through-traffic (there are bollards and concrete extensions in the way). And that it will hind fire trucks (fire trucks must use the Fire Lane which is the center lane of the main road. And the 88 spots to be lost (which I will bet money the DOT is counting total spots available now but underused or not used at all.) Granted the DOT could have explained other portions/benefits of the plan better, or even explain the VTLs pertaining to cyclists & motorists. I cycle, walk, ride the train and drive, so I utilize whatever mode of transportation I can get. Regardless of what the CB votes, cyclists will still use this road no matter what. And you don’t hesitate when the $100 million is secured for a project! I don’t think there is a guarantee that if you reject one thing, that money will easily and quickly be re-purposed for the same street for another street project (ie: resurfacing). Those two are separate projects and contracts. I have my reservations about specific locations of the project (the two-way between Eliot and Woodhaven), but it is even for the sake of the bus lanes in front of the Queens Mall being implemented, then I am willing to take it. I was riding the Q53 the other day, and the bus was denied access to the curb because a taxi was in the way. Well guess what, a motorized wheelchair couldnt reach the bus without two people physically picking it up and lowering it on the street (PS: those things are not light). You saw, I think, Ben, that I offered last night via Twitter to talk to New Life Fellowship about the spiritual imperative for making roads safer. I’ve given one such talk already at my own church, with Transportation Alternatives’ Tom de Vito. I haven’t heard back from New Life Fellowship but I’d be delighted if they took me up on my offer. Good on Mayor de Blasio. That’s leadership. What the community boards think of these projects should be an afterthought. It’s time to limit their input to things which are 100% local. What goes on with thoroughfares which anyone in the city can use is of no concern to them. Thank You! And why are these meetings the best kept secret in NYC? Consider it happenstance that I even found out about it in the first place (thanks in part to a one-liner on this site). CB4 will need to be ignored again when they (likely) vote down 111th Street changes. My fear is that deBlaiso wont do it again twice to CB4. But he’ll be ignoring these wonderful people that want it. So the appointed representative of an unelected board gets to decide a major safety question? Unreal. Does anyone know if going forward without CB approval sets a precedent? If so, it’s a good one. Congrats to the mayor for growing a pair. To say that a class 3 bike way is an after thought is just a display of ignorance and spite. Have you ridden the new lane in Woodside? The reason the paint ends is to alert cyclists that they do not have 100% right of way. The space at the slip lane is an intersection complete with a stop sign. Green paint is not continued through intersections. So there are compromises made, that does not reduce a a hard won and not so cheap to build seven mile bike way an ‘after thought’. Asking for the bike lane to stay on the same side of Queens Boulevard the whole time is “wishing away cars in one swoop”? This is yet another example of contriving a false choice between comfort/safety and convenience. What I’m asking for is the most fundamental level of design that should be expected. 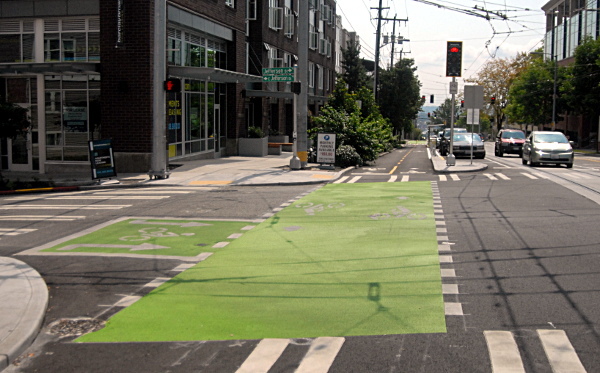 Green paint is not continued through intersections. So we should set up a situation where right of way is ambiguous? What evidence is there that that would be a better idea than a clear right of way for people continuing straight without a stop sign? That’s the most basic right of way rule. This is a standard treatment in bike friendly countries, and the NACTO bikeway guide repeatedly states the importance of visibility at intersections, and its an interim approved treatment by the MUTCD. All of the cities below have more cycling than us with the exception of Chicago. How are you going to get a new life if you don’t exit this one by being run over? Here is Phase 1 in all its glory. Can’t wait to meet Phase 2. Hopefully at least the switching sides part of the plan can be changed before it is built. I’m having a hard time believing any cyclist would actually do anything but continue on the same side regardless of what the lines tell them to do. It’s just monumentally stupid to design it in for them to do so. It’s worth noting they didn’t always allow parking on both sides of the Queens Boulevard service road. That stupidity started in the late 1990s or early 2000s if I remember correctly. Prior to that the service road had two travel lanes. It never made any sense to allow parking on both sides given that a broken-down vehicle could potentially block traffic with no way to get around it. So anyway, looking at it from a historical context, for most of Queen’s Boulevard’s life those 88 spots never existed. They never should have been put there in the first place. Taking them away is just correcting a big mistake. 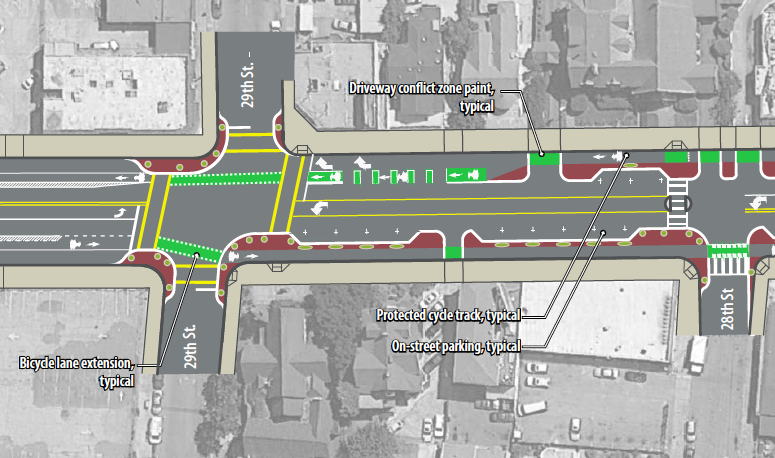 For that matter, the service road should be a curbside bus lane and a general travel lane, with no parking lane. There’s way too many better uses of that space than private car storage. Right. They even mentioned that point at the meeting, as a quick-and-dirty safety measure the slow the service road in lieu of so many fatalities. The DOT even admitted, they just added parking regulation signs just to see what would happened. However, in Rego Pk / Forest Hills, it’s as good as finding gold in the street now (which will be a hurdle to overcome as Phase III begins). Good lesson, thank you. Looking forward to finding much improvement in the 2019 and beyond capital improvements to Queens Blvd. the bike lanes on queens blvd is going to cost tax payers 100 MILLION dollars. Sounds like another pork project . Before we do that let’s first start with changing the rules of the road to something which makes sense for cyclists, like letting them yield at red lights and stop signs. Bikes are not cars. They don’t need to obey the same rules in order to function safely as part of traffic. the reason drivers have to mimimal liscene requirements is because data shows drivers are insanely dangerous. 50,000 New Yorkers are killed or maimed every year by drivers. on the other hand. cyclists injured less than 100 New Yorkers last year. Cyclists have already achieved vision zero and therefore there is no need to create another bureacracy to monitor them. once drivers stop killing and maiming 50,000 New Yorkers every year, We can look at reducing monitoring of drivers also. 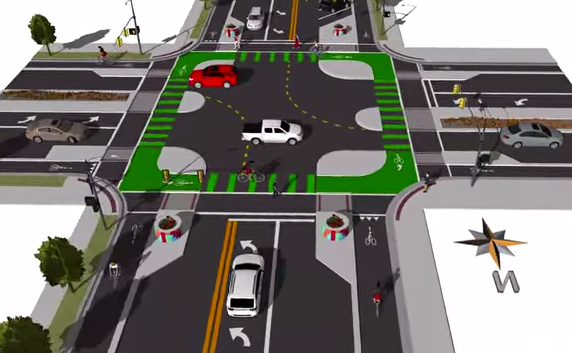 the protected bike lanes are going to cost about $2 million dollars. the driving and bus lanes are going to cost $98 million. How about requiring the pedestrians to have licenses to walk on sidewalks and crossing the streets?? We can’t have irresponsible pedestrians, can’t we? We have to make sure the pedestrians are licensed to cross the streets at designated locations. So children will not be allowed to ride bikes? Why then do so many licensed drivers disobey the rules of the road? 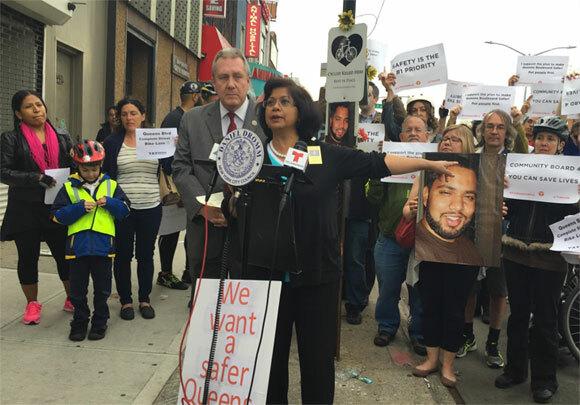 Two years ago, Council Member Karen Koslowitz stood with people who'd lost loved ones to traffic violence and said the city should do "whatever it takes" to turn deadly Queens Boulevard into a "boulevard of life" -- even if that entailed the removal of travel lanes or parking spaces. Now that the city is ready to redesign Queens Boulevard in her district, however, Koslowitz is losing her resolve.